The Crescent Dunes Solar Energy Project is a 110 megawatt (MW) net solar thermal power project with 1.1 gigawatt-hours of energy storage, located near Tonopah, about 190 miles (310 km) northwest of Las Vegas. It is the first utility-scale concentrating solar power (CSP) plant with a central receiver tower and advanced molten salt energy storage technology from SolarReserve. The project, developed by SolarReserve and owned by Tonopah Solar Energy, LLC. was anticipated to cost less than $1 billion. EPC Contractor was ACS Cobra, which carried out the engineering design, procured the equipment and materials necessary, and then constructed and delivered the facility to Tonopah Solar Energy. Planned energy output was up to 500 GW·h annually. but real data place generation at about 200 GW·h/year, less than half. Total electricity supplied to the grid in 2018 was 207 GWh. The project includes 10,347 heliostats that collect and focus the sun's thermal energy to heat molten salt flowing through an approximately 640-foot (200 m) tall solar power tower. The molten salt circulates from the tower to a storage tank, where it is then used to produce steam and generate electricity. Excess thermal energy is stored in the molten salt and can be used to generate power for up to ten hours, including during the evening hours and when direct sunlight is not available. The storage technology also eliminates the need for any backup fossil fuels, such as natural gas. Each heliostat is made up of 35 6×6 feet (1.8 m) mirror facets, yielding a heliostat overall usable area of 1,245 square feet (115.7 m2). Total solar field aperture adds up to 12,882,015 square feet (1,196,778 m2). Under a power purchase agreement (PPA) between SolarReserve and NV Energy, all power generated by the Crescent Dunes project in the next 25 years will be sold to Nevada Power Company for $0.135 per kilowatt-hour. In late September, 2011, Tonopah Solar Energy received a $737 million loan guarantee from the U.S. Department of Energy (DOE). The capital stack included $170,000,000 in EB-5 investment through SolarReserve/ACS Cobra partner CMB Regional Centers. Ground was broken on the project in September 2011. Construction terminated at the end of 2013, followed by several months of testing the plant systems. Melting about 70,000,000 pounds (32,000,000 kg) of salt takes two months. Once melted, the salt stays melted for the life of the plant and gets cycled through the receiver for reheating. The project entered commissioning phase in February 2014 following completion of construction. It began operation in September 2015, but went off-line in October 2016 due to a leak in a molten salt tank. It returned to operation in July 2017. Crescent Dunes began operation in September 2015, but went off-line in October 2016 due to a leak in a molten salt tank. It returned to operation in July 2017. While its average monthly production was expected to exceed 40,000 MWh, as of October 2018 it only exceeded half of that value during 8 months. 2012 January - The solar tower under construction as seen from a commercial airliner. The titular Crescent Dunes are at lower right. 2014 August - Completed site as seen from a commercial airliner. 2014 December - Completed site. 2016 August - Crescent Dunes in operation as seen from a commercial airliner. ^ a b "Crescent Dunes 24-Hour Solar Tower Is Online". CleanTechnica. 22 February 2016. Retrieved 15 June 2016. ^ "Crescent Dunes Solar Thermal Power Plant". Grupo COBRA. Retrieved 15 January 2016. ^ a b c "Energy Department Finalizes $737 Million Loan Guarantee to Tonopah Solar Energy for Nevada Project" (Press release). Loan Programs Office (LPO), Dept. of Energy (DOE). 28 September 2011. Retrieved 2 July 2014. ^ "Crescent Dunes: Project Under Construction". Loan Programs Office (LPO), Dept. of Energy (DOE). 1 September 2015. Retrieved 17 January 2016. ^ a b Wesoff, Eric (29 September 2011). "DOE Races Against the Clock: Two Solar Loans Closed, Seven More to Go". Greentech Media. Retrieved 29 September 2011. ^ "Crescent Dunes". www.solarreserve.com. Archived from the original on 14 August 2017. Retrieved 17 October 2017. ^ "CMB - EB5 Visa". www.cmbeb5visa.com. Retrieved 2017-03-27. ^ Tetreault, Steve (28 September 2011). "Nevada solar project to get $737 million federal loan guarantee". Las Vegas Review-Journal. Retrieved 29 September 2011. ^ Hashem, Heba (4 April 2014). "No drama as SolarReserve commissions world's largest CSP tower with storage". CSP Today Business Intelligence. FC Business Intelligence Limited. Retrieved 6 May 2014. ^ "Crescent Dunes Solar Energy Project, Nevada, United States of America". Retrieved 29 December 2016. ^ a b National Renewable Energy Laboratory (10 November 2015). "Crescent Dunes Solar Energy Project". ^ a b Las Vegas Review-Journal (21 July 2017). "Nevada solar plant back online after eight-month outage". ^ "Crescent Dunes Solar Energy, Monthly". Electricity Data Browser. Energy Information Administration. Retrieved March 8, 2017. 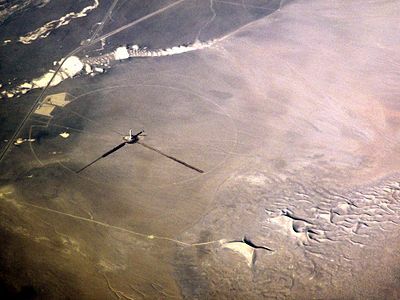 Wikimedia Commons has media related to Crescent Dunes Solar Energy Project. "Crescent Dunes Solar Energy Project". SolarReserve, LLC. Retrieved 28 April 2015. "Crescent Dunes Solar Energy Project". Concentrating Solar Power Projects. National Renewable Energy Laboratory (NREL), DOE. 20 January 2011. Retrieved 29 September 2011. "SolarReserve, LLC (Crescent Dunes)". Projects. LPO, DOE. Retrieved 16 September 2014. "American Recovery and Reinvestment Act (ARRA) Loans - Award Summary: Tonopah Solar Energy, LLC". Recovery.gov. 21 September 2011. Retrieved 2 July 2014.